All attendees at the American Girl Benefit Sale must abide by the rules & regulations listed below. Failure to do so may result in denial of entry to the sale, removal from sale grounds, and restriction from participating in future sales. 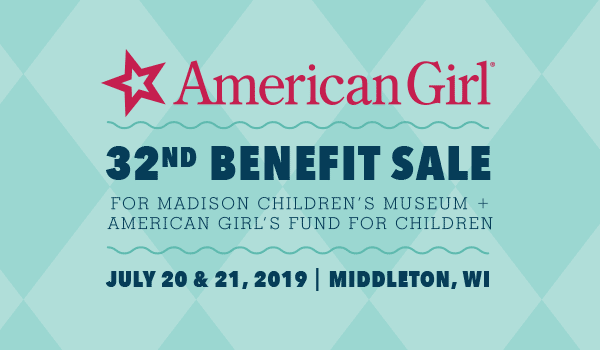 Our goal is to ensure a safe, pleasant experience for all American Girl Benefit Sale participants, volunteers, and staff. Please DO NOT contact American Girl or Mattel regarding this sale. The sale is run solely by Madison Children’s Museum staff and volunteers. We cannot accept coupons or gift cards issued by American Girl or Mattel. Madison Children’s Museum does not ship, hold, or accept telephone orders. All orders must be placed in person at the American Girl Benefit Sale, during posted sale hours. Our local UPS store will staff a booth where you can ship your own purchases. All persons entering the sale warehouse must have a ticket. This includes children (over age three) and support people assisting those with mobility difficulties. Children under the age of three are not permitted in the sale warehouse. This includes infants in carriers. Their safety is our concern. Please plan to have another adult care for your child outside the warehouse. You may enter the warehouse once per ticket. Please double-check your shopping list before you check out; you will not be able to reenter the sale without another ticket. Those who have purchased a reentry ticket may enter the sale after 2 p.m. or at the time on their ticket, whichever is later. However, you may not present more than one ticket during a single checkout to increase your purchase limits. The Saturday item limits will be published with the price list during the week before the sale, watch your email then! Sale entry times may be delayed at times due to warehouse overcrowding. We try to run on time; however, we will not admit more shoppers into the warehouse than can be safely and reasonably accommodated. We will be posting real-time updates on the line and entry times. No wheeled devices are allowed in the warehouse, except for wheelchairs and other devices to help people with mobility issues. This includes strollers, wagons, and wheeled luggage. You must be able to carry all your purchases. Please realize the space in the warehouse is extremely crowded. It is best to be able to walk independently or bring someone to help you through the crowd. A current, valid disability parking permit must be displayed for disabled parking. We are not able to provide a special time for entry for those with mobility challenges. If you need assistance, you will be able to wait near the warehouse door at checkout, rather than stand in line. Please let a volunteer know if you are not able to stand for long periods. No animals are permitted on the sale grounds, with the exception of trained service animals. There is little or no cell phone reception in the warehouse, and there is not space for you to return to the entry to consult with those outside. Everyone who needs to consult on purchasing decisions should buy a ticket and come with you into the warehouse. Previously purchased dolls are not permitted in the warehouse. As many dolls are sold in open boxes, we do not want to mistake your current doll friend for merchandise. A “doll daycare” area is provided for your doll to wait until you have finished shopping. Use of the doll daycare is at your own risk. There are NO returns! Items are refurbished returns and overstock and sold “as is.”Please check all your purchases in the warehouse so you don’t get any unpleasant surprises when you get home. Be sure to count all your purchases and double check your receipt before you depart. Smoking is not allowed in the warehouse or on the grounds. Vaping and the use of smokeless tobacco products are also prohibited.